In 1943, when Dr. Montessori was residing in India, she created a long ribbon to give her student-teachers and the school children a very sensorial impression of how long the Earth existed before man appeared. The entire length of the ribbon is 3,000 centimeters (30 meters). The black segment of the ribbon which indicates the absence of human life is 2,998 centimeters long. Only the last two centimeters are white. This drastic contrast in length between the black and white segments of the ribbon was meant to dramatize the very brief time during which human beings have inhabited our planet. 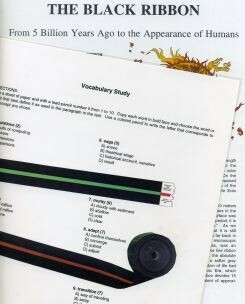 This material includes a durable ribbon 30 meters long (approximately 98.5 feet) color-coded to match the Time Line of Life and the Clock of the Eras; a Research Card that explains the origin and meaning of the Black Ribbon with an exercise in vocabulary, comprehension, and a multiple choice test. Answers for the multiple choice test are provided.